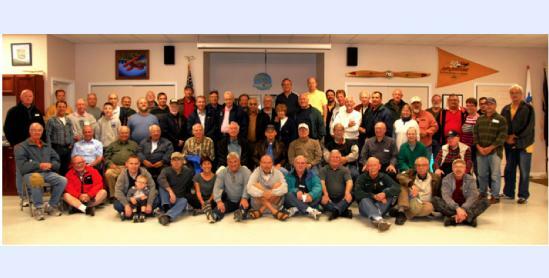 December 2015 - EAA Chapter 13 recently celebrated its 60th anniversary, and earlier this year we took an anniversary picture of our membership. Coincidently, there were 60 members in attendance that day. Those early meetings of Chapter 13 were held at the Roseville, Michigan, airport. 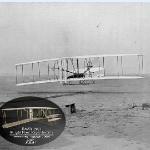 The airport was founded by the Packard Motor Car Company in 1914. Soon after our chapter was formed, the airport was sold to a development company to make room for urban sprawl. Imagine that! Chapter 13 then spent the next 40 years or so holding meetings in various locations. Mostly, they were back rooms of halls, churches, and schools. We never gave up. Eventually, we ended up using a rundown hangar at Romeo Airport in Romeo, Michigan. As time passed, some of our membership started flying out of a friendly little airport called Ray Community Airport about 40 miles north of Detroit. Two Chapter 13 members based at Ray offered to share their brand new, adjoining hangars for the chapter’s monthly meetings. Over three generations, Chapter 13 stuck together. Chapter 13 was very happy with the move to the members’ hangars and liked the atmosphere at Ray Airport. Ray Airport was tiny and also was built in our founding year of 1955. We felt a connection and found a home. There was an old cinderblock hangar at Ray that was badly in need of attention. 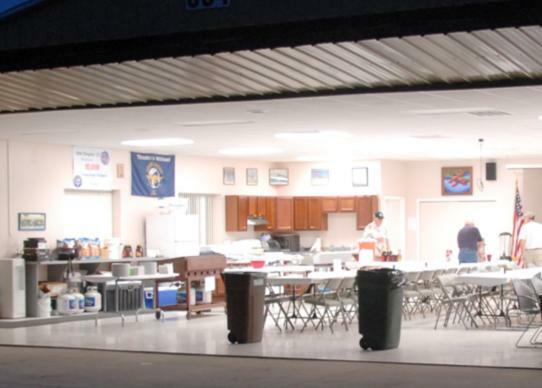 The membership decided to purchase the old dilapidated hangar and turn it into our new, permanent home. One of our members, Dave Shirey, offered $25,000 towards the purchase and renovation of the hangar, looking for the membership to come up with a matching-fund donation. Chapter 13 members quickly dug into their pockets and came up with enough funds to match Dave’s donation…and more. After the deal for the purchase was made, the members went to work, turning the EAA Chapter 13 hangar into an attractive focal point of the Ray airport. With lots of volunteer help, members gutted the building and turned it into our beautiful new Chapter 13 home. Meanwhile, several chapter members, including Doug Conciatu, also became members of the Ray Airport board. They worked with local government and the Michigan state DOT Aviation Division to upgrade the airport. Over the years, the main runway was resurfaced, a parallel taxiway was built, and other taxiway improvements were completed. Next came a significant expansion of the fueling station and airport parking apron. People came to Ray. Many additional hangars were built, and the airport office was remodeled. In his spare time, Doug volunteered at Pioneer Airport in Oshkosh flying antique biplanes, Young Eagles planes, and the Ford Tri-Motor. Doug personally introduced over 2,200 Young Eagles to the joys of aviation. Chapter 13 has always been very active. At the end of each year, we have an awards banquet, often celebrating members who have completed and begun flying their homebuilt aircraft. As many as seven homebuilts have been completed by Chapter 13 members in one year! Nick Seraphinoff has completed 13 aircraft over his years with Chapter 13. In addition, EAA has presented a Major Achievement Award to member Bob Mahieu, and a Young Eagles Coordinator of the Year Award went to Dennis Glaeser, as well as a Newsletter Editor of the Year Award to Tom Vukonich. What makes Chapter 13 so successful is no secret. We all love aviation and strive each day to share our passion with as many people as possible. Chapter 13 is 100-plus volunteers strong. We fly Young Eagles every month from spring through fall. In 2014, we crossed the 10,000 Young Eagles flight mark! We have forged a great relationship with the Radio Control Club of Detroit, an aircraft modelers association also incorporated in 1955. Additionally we host an annual Dawn Patrol breakfast. Chapter 13 members are well-known for their willingness to get involved by volunteering. There are plenty of opportunities to get involved at our chapter events, hangar projects, etc. Many of our members go to Oshkosh every year and volunteer to work at AirVenture each summer. We’ve learned that when we volunteer and get involved, we ourselves benefit the most and, not surprisingly, have great fun in the process!